The inaugural meeting of UNESCO’s High Level Forum on Museums was held in Shenzhen, China from 10 to 12 November 2016. As advisory body to UNESCO Director General and in the context of the 2015 UNESCO Recommendation concerning the Protection and Promotion of Museums and Collections, their Diversity and their Role in Society, the Forum addressed the important role of museums in society, and focused on promoting museum development and diversity. This event was co-organized with the National Commission of People’s Republic of China to UNESCO, Shenzhen Municipality, ZhiZheng Art Museum and the State Administration for Cultural Heritage (SACH) of China. The Forum was a major opportunity to bring more than 50 world class museum directors and thinkers, policy makers and stakeholders together to discuss critical issues for the future of museums. The Shenzhen Declaration was adopted at the end of the Forum, and underscores the social, cultural, educational and economic roles of museums in contemporary societies, and their contribution in educating citizens across the globe for more a peaceful world and in achieving sustainable development goals. The Forum’s major topics included new museum sector trends and public policies, the protection of cultural property and collections, the ethical and technological standards for museums, how better to engage and benefit communities. The implementation of the 2015 Recommendation and reinforcement of international cooperation in the field of museums was highlighted. Going forward, the High Level Forum on Museums recommended the publication of a Global Museum Report under the coordination of UNESCO. Preface: The Shenzhen Declaration on Museums and Collections (2016) was adopted by the UNESCO’s High-Level Forum on Museums, Shenzhen, People’s Republic of China, 10-12 November, 2016. 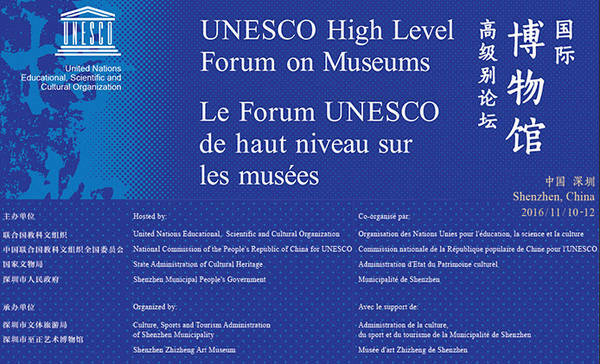 The High Level Forum on Museums (in Chinese: 国际博物馆高级别论坛) was established by UNESCO to bring policy makers and the global museum community together to advance the role of museums in generating social, cultural, educational and economic benefits, which is at the heart of UNESCO’s 2015 Recommendation concerning the Protection and Promotion of Museums and Collections, their Diversity and their Role in Society. Its inaugural meeting was held in Shenzhen, China, from 9 to 12 November 2016. The Forum was co-organized with the National Commission of People’s Republic of China to UNESCO, Shenzhen Municipality, ZHIZHENG Art Museum (in Chinese: 至正艺术博物馆) and the State Administration for Cultural Heritage (SACH) of China. More than 200 guests including curators, researchers and representatives from all around the world attended the forum. The Forum was a major opportunity to help the museum community craft much needed tools to address critical issues. The Shenzhen Declaration calls on all stakeholders to enhance the role and capacities of museums in protecting cultural heritage, adopting ethical and technological standards and developing cooperation at the international level. It also encourages the full implementation of the 2015 UNESCO Recommendation and explores the possibility of a global museum report. It furthermore invites UNESCO and ICOM to explore the possibility of publishing a global museum report. The Shenzhen Declaration was drafted in collaboration with ICOM and encompasses ICOM’s vision and ethical approach. In a message addressed to the participants, President Xi Jinping of the People’s Republic of China, declared that “museums are bridges that link our past to the present and future.” Ms Liu Yandong, Vice Premier of the People’s Republic of China, opened the High Level Forum and reaffirmed the many functions of museums in modern societies, stating “the museum of today is not only an institute for collections, protection, research and display of cultural heritage, but also one for providing public cultural services and social education.” She recalled that China’s 4,692 museums host over 200,000 educational activities every year, and noted that the vitality of museums today requires technical support. On this occasion, ICOM Director of Programmes and Partnerships, France Desmarais, participated in a panel dedicated to “Illicit trafficking of cultural property: the importance of documentation, inventories, authentication“. ICOM Vice-President, Alberto Garlandini, was also invited to present the ICOM Code of Ethics, during a panel dedicated to “Ethical Standards of Museum Professionals”. Other ICOM members, such as Carlos Brandao, member of ICOM’s executive board and former Chair of ICOM Brazil, Dorota Folga Januszewska, Chair of ICOM Poland, Chedlia Annabi, former Chair of ICOM Arab, and Jean-Paul Koudougou, former Chair of ICOM Burkina Faso, were also present. Museums stand at the crossroads of several social challenges today, as a source of jobs and revenues at the heart of the creative economy, fostering a sense of belonging and social cohesion, and as key drivers of international cooperation. They are on the front-line of the fight against illicit trafficking in cultural property and are primary targets in times of conflict. Markus Hilgert, Director, Ancient Near East Museum Pergamonmuseum (Germany), called for museums to “take the lead, within their communities, in creating resilient networks of cultural heritage protection.” Emily Rafferty, President Emerita, The Metropolitan Museum of Art (USA) gave the example of the thousands of New York citizens visiting the MET in the aftermath of 9/11 to highlight the power of museums as unifying forces able to foster a sense of belonging. The Forum was a major opportunity to help the museum community craft much needed tools to address critical issues. The Shenzhen Declaration on Museums and Collections (in Chinese: 《关于博物馆和藏品的深圳宣言》,简称《深圳宣言》) calls on all stakeholders to enhance the role and capacities of museums in protecting cultural heritage, adopting ethical and technological standards, and developing cooperation at the international level. It also encourages the full implementation of the 2015 UNESCO Recommendation and explores the possibility of a global museum report. Going forward, the Forum will serve as an advisory body to the Director-General, who called for innovative cooperation to promote museums and to reduce inequalities among them. In the margin of the Forum the Director-General had bilateral meetings with Minister of Education Mr Chen Baosheng, to discuss the state of cooperation with China, including the links between educational and cultural policies and the role of culture for sustainable development, for which China is one of UNESCO’s strongest advocates. The Director-General also visited the UNESCO Center of Innovation on Higher Education at the University of Science and Technology of South of China. The visit took place in the presence of the Director of the Center, Mr Li Ming, and the Vice-mayor of Shenzhen and member of the governing board of the Center, Ms Wu Yihuan. Participants in the UNESCO High-level Forum on Museums and the forum’s staff pose for a picture after the forum closed Saturday. The UNESCO High-level Forum on Museums closed Saturday morning in Shenzhen. The UNESCO Director General Irina Bokova pointed out at the closing ceremony that the forum aims to implement the 2015 Recommendation concerning the Protection and Promotion of Museums and Collections, their Diversity and their Role in Society. The Closing ceremony of the Forum was held in the presence of Mr Chen Baosheng, Minister of Education of the People’s Republic of China, Vice-Minister Hao Ping, President of the National Commission, Mayor Xu Qin of Shenzhen City, Mr Khaled El Enany, Minister of Antiquities of Egypt and Mr WU Fuqing, Board Chairman, Director of the ZHIZHENG Art Museum, as well as directors and representatives of the world’s most important museums. Museums serve more purposes than just collection, as it is a place where people can learn about other cultures and histories, said Bokova. In recent years, China has become the nation with the most new museums. Museums serve as an important platform for China’s development, she said. Minister of Education Chen Baosheng announced the closure of the UNESCO High-level Forum on Museums. He said that UNESCO is one of the most important international organizations. China has always been a staunch supporter and a key partner of UNESCO. The success of the UNESCO High-level Forum on Museums marks a new level in cooperation. Chen sincerely hopes that all countries can cooperate in the museum industry to contribute to a wide diffusion of culture. Shenzhen Mayor Xu Qin said at the closing ceremony that it was such an honor for Shenzhen, the UNESCO Creative City for Design, to host this forum. “Thanks to UNESCO, the National Commission of the People’s Republic of China for UNESCO, and the State Administration of Cultural Heritage for your trust in this rising city,” said Xu. Shenzhen will commit to greater and sustained international cooperation, Xu said, with an emphasis on museum operation, collection and research. 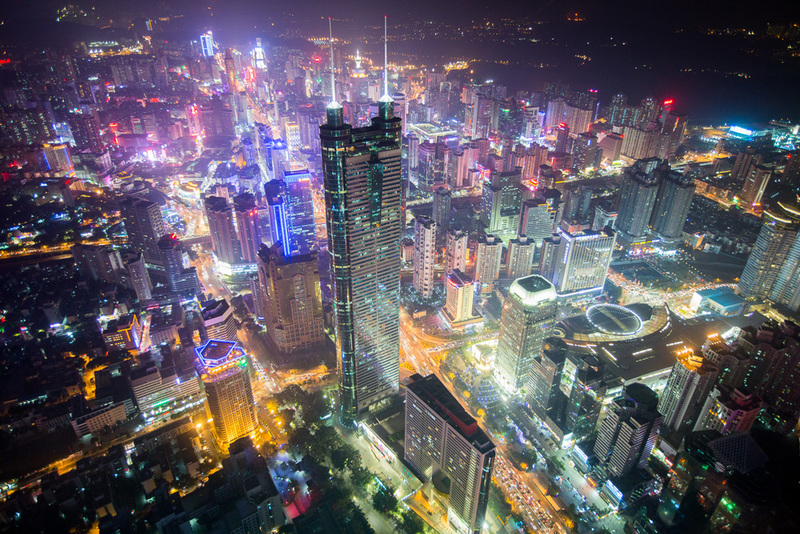 He added that Shenzhen would continue to work toward the education of human civilization. Develop cooperation at the international level. 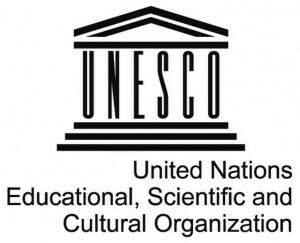 The Declaration also encourages the full implementation of the 2015 UNESCO Recommendation and explores the possibility of a global museum report. Diversity of museums and collections, and their operational modalities. Role of museums in the protection of heritage in times of peace and conflict. Responsibilities of museums – ethical, professional and technological standards for museums and professionals and community engagement. Greater national and international cooperation. The Declaration strongly promotes the diversity of collections. It reconfirms museums as expert institutions that contribute to heritage protection. Additionally, it underlines the moral obligation and capacity of museums to counter illicit trafficking in cultural objects. The Declaration encourages museums to adopt a rigorous code of ethics and to develop, where possible, cooperative projects. The UNESCO’s High-Level Forum on Museums, Shenzhen, People’s Republic of China, 10-12 November, 2016. The Shenzhen Declaration calls on all stakeholders to enhance the role and capacities of museums in protecting cultural heritage, adopting ethical and technological standards, and developing cooperation at the international level. The Shenzhen Declaration encourages the full implementation of the 2015 UNESCO Recommendation and explores the possibility of a global museum report. The Shenzhen Declaration strongly promotes the diversity of collections and reconfirms museums as expert institutions that contribute to heritage protection. The Shenzhen Declaration underlines the moral obligation and capacity of museums to counter illicit trafficking in cultural objects, and encourages museums to adopt a rigorous code of ethics and to develop, where possible, cooperative projects.